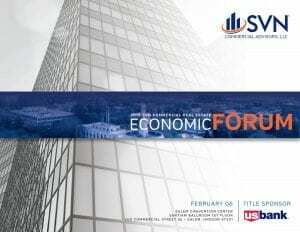 SVN Commercial Advisors presented it’s annual Economic Forum to 240+ local owners, developers, architects, lenders, attorneys and city officials on Wednesday, February 6, 2019 at the Salem Convention Center. Speakers for this event included Curt Arthur, SIOR, Managing Director of the Salem SVN office, Nick Williams, SVN Advisor, Erik Andersson, CEO of SEDCOR, Katherine Powell Banz, MAI of Powell Banz Valuation LLC and Mike Erdmann, CEO of the Home Builders Association of Marion & Polk Counties presenting market updates for industrial, multi-family, agriculture, office, retail and the residential development sectors for the Salem/Keizer area. This years Master of Ceremonies was the City of Salem Mayor Chuck Bennett. We sincerely appreciate the support from our sponsors this year; Title Sponsor U.S. Bank. Corporate Sponsors Pence Construction, Saalfeld Griggs PC and White Oak Construction. Community Partners Cascade Capital Funding, CB|Two Architects, CD Redding Construction, Dalke Construction, Fischer, Hayes, Joye & Allen, LLC, Garrett Hemann Robertson PC, Maps Credit Union, Powell Banz Valuation, Sherman Sherman Johnnie & Hoyt, LLP, Studio 3 Architecture and Willamette Community Bank. Having the support of these businesses makes this event the success it is. We are proud to have them in our community and as our partners. Please support their businesses and thank them for supporting the commercial real estate community! If you missed the program, you may download the full booklet version HERE. Or watch the video taped by CCTV Forum Video by CCTV . Please feel free to share it within your industry, clients and peers. Watch the SVN Commercial Advisors facebook page for the announcement of the next Forum Event date in 2020!